Antique enamel and pearl brooch from the 1880's. Product code: ES5250 Categories: Antique, Antique Brooch. Holding this antique brooch in your hand, let alone wearing it on the lapel of a jacket, it is surprising to think that it is over 130 years old yet still looks so good and is in such wonderful condition. 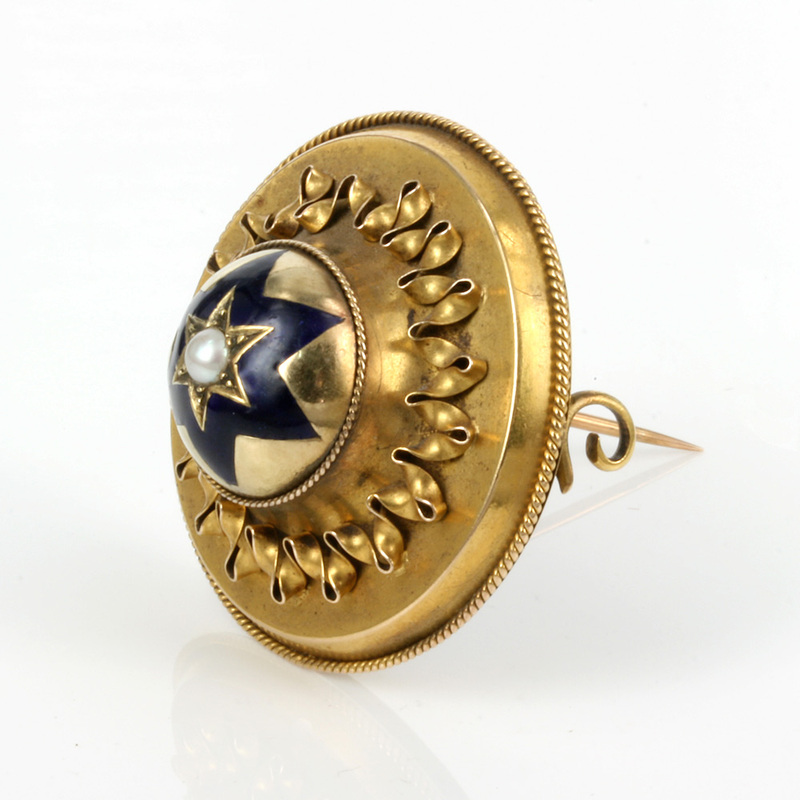 Made in the 1880’s in 15ct gold, this circular brooch is set with a central pearl bordered by a wonderful cobalt blue enamel star pattern. Then surrounding this, is the most elegant frill work with a twist wire on the outside edge of the brooch. All of these features really work so well together in making it so elegant and versatile to be worn with so many different outfits. Turning the brooch over reveals a photo locket compartment to have a picture of a loved one always close to you, making this become even more personal and dear to the wearer. Measuring 39mm in diameter by 20mm in height, this wonderful brooch is so typical of the elegance of the Victorian era and will always look so regal and fine.